On the Space Opera: Writers group on Facebook, we were treated to the presence of Andre Polk. We SF writers tend to be a cynical lot, and Andre had an optimism we all found refreshing. One of the things Andre did was to pose his “Question of the Day.” It was often a way to spark creativity, and the threads he spun out of it never seemed to go off the rails. Most groups, you could almost set your watch by how long a comment thread goes from the topic at hand to some frothing screed about Trump or Brexit or some other BS we all want to forget. Nope, Andre raised the tone and the IQ of discussion in the group. He was fighting sickle-cell in the time we knew him, but it didn’t stop him from working on his first novel. Until the disease killed him. It’s one of the few losses of a stranger that you almost felt physical. It was a blow to the group. 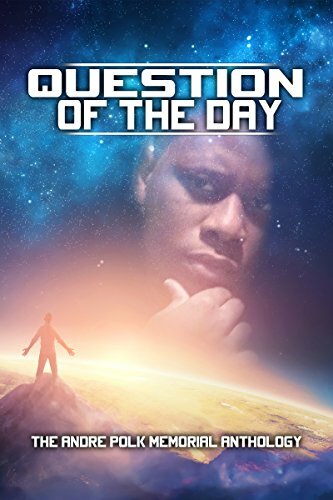 So several of us put together an anthology in memory of Andre, called A Question of the Day. And it’s available now on Amazon.